Precision made in Europe. As per DIN 8606. The heart of a system, versatile and expandable. Main switch with auto-start protection and emergency off. Precision lathe chuck as per DIN 6386 (Ø 100mm). Quick-change tool post with 2 holders (with stop and height adjustability). With rotating centre MK 2 and tailstock chuck. Aluminium handwheels with adjustable graduated collar made from steel. Switch for clockwise, off and counter-clockwise rotation. Cross-braced cast iron bed, wide-legged shape, and prism slides for apron and tailstock. Protected lead screw with 12 x 1.5 Acme thread. Centre distance 400mm. Swing 85mm. Height over cross slide 58mm. For machining steel, brass, aluminium and plastic. 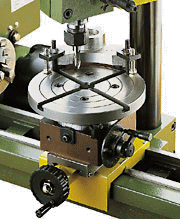 For face and straight turning, taper turning and thread cutting. With an extensive range of system accessories you can also drill, mill and slot. 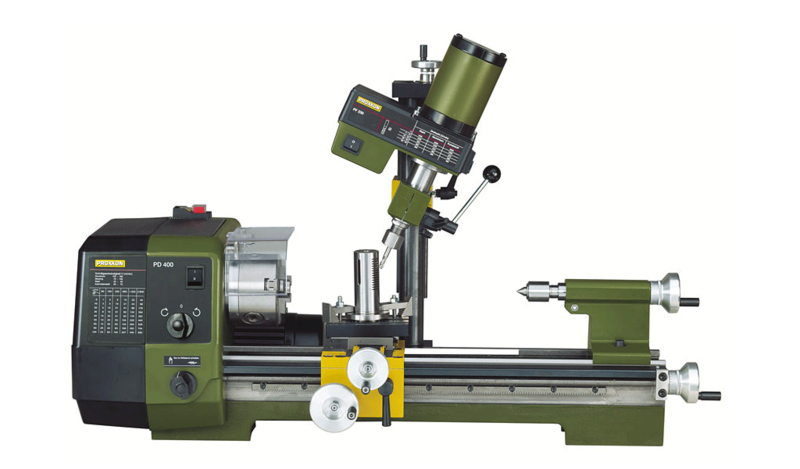 The lathe PD 400 is also available as CNC version (PD 400/CNC) with recirculating ball spindles, step motors and user-friendly WINDOWS-compatible software. Machine bed: Of high quality cross-braced cast iron with wide-legged, prism slides. For vibration-free work even at high loads. With flange and threaded holes at back for fastening the drill and mill head PF 400. Covered lead spindle. Headstock: Of die-cast aluminium. Oversized main spindle with two adjustable taper roller bearings and MK 3 bore on chuck side. Spindle bore 20.5mm. Run-out without chuck 1/100mm. Rotary switch for engaging the automatic feed (optionally 0.07 and 0.14mm/rev.). Lead and feed spindle with trapezoid threading (12 x 1.5mm). Tailstock: Of die-cast aluminium. Sleeve Ø 24mm, retractable up to 40mm. With mm scale. With live centre MK 2 and 10mm gear tooth chuck (B 12 - bore/MK 2). Support: Bed carriage made of die-cast zinc. Cross slide (adjustment 85mm) and top slide (setting range 52mm) of steel. Top slide can be swivelled for taper turning (degree graduation up to 45° available). With multiple tool posts and two tool post elements for quick change and easy height adjustment. For turning tools 10 x 10mm. Drive: Powerful capacitor motor for two speeds and additional threestage belt drive. Spindle speeds at stage 1: 80 - 330 - 1,400rpm. For stage 2: 160 - 660 and 2,800rpm. 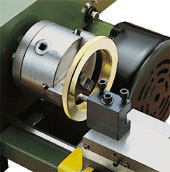 Lathe chuck: High quality 3-jaw chuck as per DIN 6386 Class 1 (concentricity tolerance 0.04mm). Capacity through reversing chucks 3 - 100mm. Including lathe chuck guard with safety shutdown. Handwheels: Of aluminium, with scale ring adjustable to 0. For cross slide and top slide: 1 division = 0.025mm. 1 rev. = 1mm. For tailstock and lead spindle: 1 graduation line = 0.05mm. 1 rev. = 1.5mm. Support quick adjustment: By means of large handwheel fastened to bed by toothed rack. Thread cutting device: For left-hand and right-hand thread. With change gears for 19 different metric pitches: 0.2 - 0.25 - 0.3 - 0.35 - 0.4 - 0.45 - 0.5 - 0.6 - 0.7 - 0.75 - 0.8 - 0.9 - 1 - 1.25 - 1.5 - 1.75 - 2 - 2.5 - 3mm. Also for inch threads from 10 - 48TPI. 230V. 50/60Hz. Size L 900, W 400, H 300mm. Weight approx. 45kg. Motor rated input 870W, power output 550W, motor speeds 1,400 / 2,800rpm. A tool holder with two adjustable inserts is included as standard. Made from 1.5mm steel plate, powder coated. A welded cover protects the motor. Mounting holes and raised base to secure the lathe are pre-drilled. Seeping through of coolant is impossible. Length 800 x width 270 x height 290mm. The lathe depicted here is not included. Identical to the lathe chuck of lathe PD 400. Capacity through reversing chucks 3 - 100mm. The jaws are not independently adjustable, i.e. they are self-centering. High accuracy. Chuck diameter 100mm. Used to mount irregularly and asymmetrically shaped objects. Each jaw is adjusted individually and centering is thus achieved manually. Hardened, reversible jaws. Chuck diameter 100mm. Is fitted instead of the standard chuck. Ideal for clamping larger and asymmetrically shaped work pieces. Ø 125 mm. 2 continuous T-slots. With clamping jaws. For accurate use on round components. One hardened collet each hardened collet 2 - 3 - 4 - 5 - 6 - 8 - 10 - 12 and 14mm are included. Concentric accuracy better than 0.02mm, much better than a chuck. One soft collet for making a custom size yourself. The included collet attachment is mounted in the place of the headstock chuck. Supplied in a wooden box. Ideal when turning with highest possible accuracy. Supplied with 2 dead centres (MK2 and MK3), drive/ face plate with 30mm bore as well as reducing bushes 30/20mm and 30/15mm. A threaded drive pin screws into the headstock flange and the drive plate. Used on the PD 400 when turning long, slender work pieces. 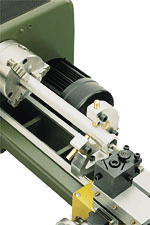 Fitted directly to the bed-ways and is used when the tailstock support is inadequate. Maximum Ø 50mm. Fitted to the carriage of the lathe. Indispensable when turning long, slender work pieces. Maximum Ø 50mm. Including two holders. Provides quick tool changes with easy height adjustment. For turning tools 10 x 10mm. Fits the tool post of PD 400. Cutting tools of high quality cobalt HSS steel, ground. One each roughing out, parting, finishing cut, left and right cutter. Comes in wooden box with sliding lid. 10 x 10 x 80mm. One cutter for external thread , one for internal thread (both ground to 60°, metric), one general cutting . Supplied in wooden box with sliding lid. 10 x 10 x 80mm. for 90mm boring bar, holes from 12mm. Standard tungsten inserts, 55°, plated (commercially available version). Three additional inserts securing screw and key TX 8 are included. 10 x 10mm. For the holders as described above. Used in the PD 400 quickchange system. Used to part stock and cut slots. The 12 x 3 x 85mm HSS tool contains cobalt. Made of HSS steel. DIN 333 (type A) 60°. Complete set centre drills with sizes of 2.0 - 2.5 and 3.15mm. One each cutter for 60 degree (metric) and 55 degree (Whitworth) inside threads, 1.3mm - 2.65mm and 4mm. Shaft of Ø 6mm. Length 95mm. The cutters are held by a tool holder (8 x 8mm) that mounts to the tool post of either PD 230/E, PD 250/E or PD 400. Comes in wooden box with sliding lid. Tool holder for rotary tools. For use on lathe machines. Made of steel with standard 20mm MICROMOT collar size. 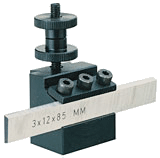 For precise clamping of rotary tool IBS/E or LBS/E in the tool post of the lathe. Shaft 8 x 10mm. Total length 65mm. Ground in pairs. For adjusting work on drilling machines, lathes and milling machines. Made of high-alloy, hardened steel (58 - 62 HRC). Parallel accuracy 0.002mm. 2 each of 8 x 10, 15, 20, 25, 30, 35 and 40mm. Length 100mm. Packed in a wooden box. Die holder for round die. For threads M 3 - 4 - 5 - 6 - 8 and 10. With holder Ø 10mm for mounting in the tailstock drill chuck of the lathe. The holder is held by hand while cutting the threads. Neatly packed in wooden box with sliding lid. Incudes column (35 x 400mm), mounting bracket and fastening screws. For mounting on previous models of the PD 400 two tapped holes need to be drilled into the lathe's bed. Future PD 400 will come equipped with these tapped holes. 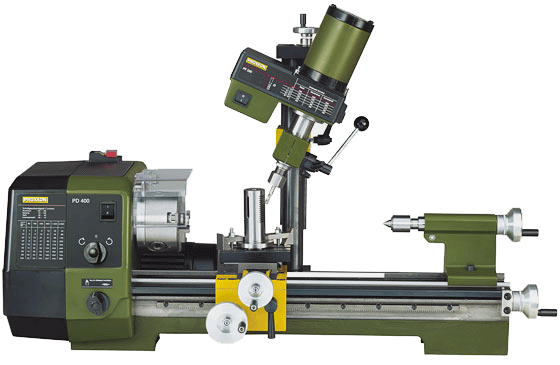 The lathe's top slide is replaced with the table (supplied) of 110 x 70mm, with 3 T-slots 12 x 6 x 5mm. The lathe now functions as a compound table, with X-Y travel being longitudinally and cross-wise respectively. The mill/drill head is identical to the miller FF 230. Three collets of sizes 6 - 8 and 10mm are included. Lathe, milling cutters, work clamps and blocks not included in system. Easily installed in a few seconds. The feed may be used via either the height feed (vertical) or the fine feed in the tilted position. The graduated scale may be zero reset. One revolution is equivalent to 1.5mm spindle travel (1 division = 0.05mm). For accurate machining of circular work pieces. The table may be fixed horizontally or vertically. Worm drive for division through 360° allowing for almost all possible divisions below 100. Supplied with 4 index plates: 27/42, 33/40, 34/39 and 36/38. Used to manufacture sprockets, gearboxes and drives, ratchets, cams, etc. (the faceplate is not included). The taper is identical to the main spindle of the lathe. With matching nuts and screws for fixation in MICROMOT standard T-slots (12 x 6 x 5mm). Supplied in a wooden box with sliding lid. Industrial quality, however not as accurate as the collets. With 10mm adapter which fits into the 10mm collet. Includes the chuck key. Includes 1 each of 2.4 - 3 - 3.2 - 4 and 5mm, for milling cutters. Supplied in a wooden box with sliding lid. Step clamp set of steel. 2 step blocks and clamps each. With matching slot nuts and fastening screws for T-slots as per MICROMOT standard (12 x 6 x 5mm). In wooden box with sliding lid. Perfectly rectangular. To be placed sideways and on the end face. With matching nuts and screws for fixation in MICROMOT standard T-slots (12 x 6 x 5mm). Supplied in wooden box with sliding lid. Jaw width 60mm. Clamping capacity 42mm. Total length 100mm. Used to clamp various work pieces. Made from hardened steel, precision ground in pairs. Four different depths of prism incisions V, all at 90°. Size 50 x 30 x 30mm. 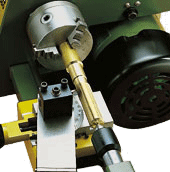 The solid clamp and knurled knob ensure superb securing of the workpiece. Supplied in a wooden box with sliding lid. All cutters with 6mm shaft. Cutters of Ø 2 - 3 - 4 and 5mm. Double fluted according to DIN 327. Made of HSS. Comes in wooden box with sliding lid. 4 cutters Ø 6 - 7 - 8 and 10mm. Four flute design according to DIN 844. Shafts 6 and 10mm respectively. Made of HSS. Comes in wooden box with sliding lid. Used for fast and accurate location of starting point of work pieces with respect to the machine spindle on milling machines. Size 6 x 6 x 50mm and 6 x 5 x 75mm. Comes in wooden box with sliding lid.